Conference Facilities South Africa has a comprehensive list of conference venues and centres with conference facilities in the Escarpment region of the Mpumalanga Province in South Africa. The Escarpment region of the Mpumalanga province in South Africa is known for its good rainfall. This area has a wealth of hiking trails winding through pine and indigenous forests with age old tree ferns reflecting the distinctive charm of the Escarpment region of Mpumalanga. The region is also known for its panoramic views and seasonal grasslands strewn with wild flowers, aloes and proteas. The many streams of the Mpumalanga Escarpment are rich with trout and fly fishing is a popular activity here. The Escarpment Region of the Mpumalanga province in South Africa has many spectacular waterfalls that is worth visiting. The better known of these waterfalls is the 150m high Berlin falls at Lisbon. Other popular waterfalls include Lone Creek, Mac Mac, Maria Shires, Forest, Bridal Veil and Horse Shoe falls. Belhaven is one of the Mpumalanga Escarpment town of Barberton's most elegant old buildings. It has been transformed into a museum furnished in the style of a wealthy Edwardian family home. Two other museums depicting the early days are Fernlea House and Stopforth House. The rocks of Barberton area is home to the only known verdite deposits in the world. The Fortuna Mine Trail in the hills above Barberton evokes images of the hardships endured by prospectors in their search for gold. The Blyderivierspoort Nature Reserve in the Escarpment Region of Mpumalanga stretches from the Pinnacle near Graskop to Swadini in the north. This reserve is characterised by striking rock formations and a rich diversity of plants which support an equally rich and varied fauna. The Bourke's Luck Potholes, which are deep cylindrical cavities formed by river erosion and the action of flood water are situated within the reserve. The panoramic views of God's Window provides views stretching across miles of thickly forested mountains, the fertile lowveld and the Blyde River Canyon. The Mpumalanga Escarpment town of Lydenburg lies in a wide fertile valley against a backdrop of rolling hills and enormous cultivated forests. Lydenburg is well known for its well-preserved old buildings. East of the town you will find the Gustav Klingbiel Reserve which has antelope and over 100 bird species but is also the site of archaeological ruins from the Later Iron Age. The Lydenburg Museum is situated in the reserve. Pilgrim's Rest is a living museum and has been transformed into a replica of an early gold mining town in South Africa. Gold was discovered here in 1873 and many of the restored miners' houses now serve as shops. The Alanglade House Museum in Pilgrim's Rest offers guided tours of the former mine manager's house. The Dredzen Shop Museum consists of a store stocked with a range of items in use nearly a century ago. Horse riding trails through the Pilgrim's Rest Nature Reserve surrounding the town are conducted daily. 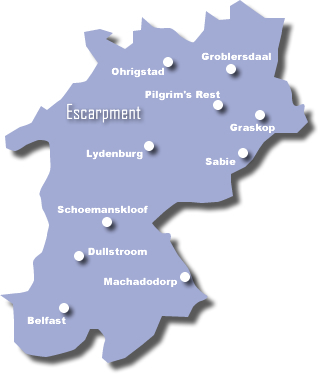 Some of the better known towns in the Escarpment Region of the Mpumalanga province in South Africa include Belfast, Dullstroom, Graskop, Groblersdaal, Lydenburg, Machadodorp, Ohrigstad, Pilgrim's Rest, Sabie and Schoemanskloof.